The Title of the book pretty much sums this book up in a nutshell. For those of us who thought we knew the story of Rorke's Drift and how and why it was fought, and also the story about all of the Victoria Crosses that were won there, we might be in for a bit of a shock. The Zulus destroyed a camp and killed over 1,300 British soldiers and their African allies at iSandlwana on January 22, 1879. A few hours after that the Zulu Undi regiment crossed the Buffalo river into Natal. The Undi regiment was kept in reserve during the battle, so the warriors' blood was up. Prince Dabulamanzi, the Undi regiment's commander, decided to cross the river against his king Cetshwayo's orders. The next British encampment of any size would be Rorke's Drift. When Lord Chelmsford came back to his destroyed camp at iSandlwana, he could see the fire in the distance from the battle at Rorke's drift. For those of us who have had the pleasure to see it, the 1964 movie 'Zulu' starring Michael Caine and Stanley Baker encapsulates all of our thoughts about the battle. The only thing is that, as usual, the movie version of a historical event is not really historical. Although to be honest, this movie stays closer to the truth than many others. 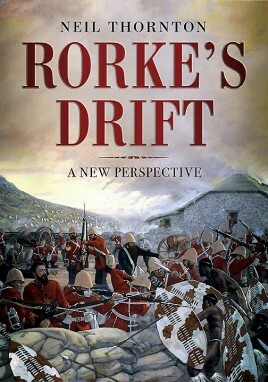 The real story of Rorke's drift does have all of the makings for a movie blockbuster. You have cowardice, bravery, and a desperate defense of about twenty to one odds or better. The book starts with the actual history of Rorke's drift and why it was there and it's various uses before that fateful day. It started out as a trading post owned by Jim Rorke at a crossing place of the Buffalo River. Strangely enough its next incarnation was as a missionary post and chapel owned by the Church of Sweden, no less. The British negotiated the rental of it for their invasion of the Zulu's lands. It was used by the British as a supply depot at this time. The fact that it was stuffed with supplies for the army was an extremely good stroke of luck for the British soldiers stationed there. The tons of mealie bags and biscuit boxes that were stored, were the makings of their impromptu walls and fortifications besides the little bit that the Drift had to offer itself. The Drift was awash with escapees from the massacre at iSandlwana before the battle. Almost 500 African allies and British soldiers were there. The appearance of the Undi regiment caused a panic and only 155 soldiers, mostly of B company of the 2/24th regiment, stayed to defend the Drift. The book goes into minute details of the actual defenses that the soldiers built, and who was where at what time during the battle. The exploits of John Chard and Gonville Bromhead, and all of the other heroes of the battle are described in detail. For more than 10 hours, the 3,000+ Zulus attacked the Drift and its 155 defenders. A lot of the time the fighting was down to bayonet against assegai. The defenders and attackers had nothing to say about their enemies, except to mention their bravery. The book first sets the scene and then goes into the battle itself. It then goes on to describe the battle's aftermath. Next it goes into a long list of the 'Gallantry Recipients' with a short biography and the stated reasons for their awards. To many, the book's part of 'Unjust Criticism' will be the most interesting. Apparently many, including the new area commander Sir Garnet Wolsley, did not think much of the heroes of the Drift, and didn't even think some of them deserved their medals! The stirring epic of the defense of Rorke's Drift certainly needed this book to separate fact from fiction. Hopefully the author is at work on a book about the battle of iSandlwana with this much detail. I don't see anything here that wasn't covered in Washing of the Spears by Donald Morris. The 'Washing of the Spears' is an excellent book that I have read a few times. It is however, a history of the Zulu nation. The minutiae of a battle like the Drift isn't there. I didn't realize until this book that the order to pull away from the outer barricades, not only saved the battle for the British. It was also pretty much a death sentence for the fighters and wounded in the hospital. The maps/illustration of the Drift during the battle and the corresponding personal stories show this to you.